The Japanese gardens are probably the most known of the Asiatic gardens. The Japanese artists have taken over the garden art from the Chinese artists but they have imprinted the discipline and order that are characterizing this nation. The Japanese gardens can be organized around an temple, an tea pavilion, an palace or can be constituted by dry elements – karesansui, known as Zen gardens. Some elements are typical to these gardens: the water (real presence or symbolized by the stones help), the rocks (sometimes suggesting a mountain presence), the stone lanterns, the footbridges (arched or in zigzag), the islands (presenting sometimes symbolic forms) and the pavilions (simple or exuberant decorated). The taste for the beauty of the stones presents in Japan a particular refinement and represents an essential element of the tea ceremony. The stone has a impressive robustness and polished or processed it is emanating the brilliance and the elegance of culture. The lanterns made also from stone are mysterious presences in the garden that are protecting the fires lighted by faithful or are illuminating the nocturnal tea ceremonies. With the stones help, the sinuous alleys are traced to model the steps in a special rhythm that permits the contemplation of the garden landscape. From the vegetal elements some are always present: the bamboo or the pine tree, the symbol of loneliness. The flowered cherry tree, wisteria, the lotus are representing delight and celebration motives for the Japanese people. Their attitude towards flowers has brought them celebrity and has conducted to the apparition of a specific art: ikebana. 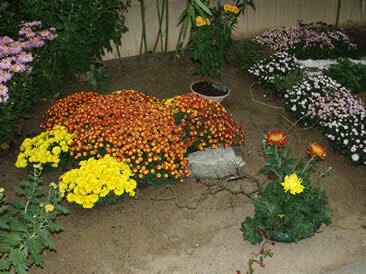 The plant pompously celebrated in autumn is the chrysanthemum. Although it is said that the chrysanthemum has appeared for the first time in China, this flower is most frequently associated to Japan. It is natural to be so if we are thinking that for 10 centuries the imperial emblem of Japan has been a 16 petals yellow chrysanthemum. In October, the chrysanthemum is venerated by Japanese nation by exhibitions realization where fanciful floral arrangements can be admired. The Zen garden is characterized by austerity and the component elements represents symbols full of mysteries. In this garden we have suggested the mountains with the help of the stones, the sand has been raked to remind the waves movement, also we have found a discreet place for some mosses spots, all of these inviting you to a profound meditation state, and to find that the one who has given soul to the garden is the spectator himself. In this garden we have tried to reunite symbols appreciated by Japanese nation with the help of a venerated plant in the Rising Sun Country: the chrysanthemum. Thus, we have represented the Fuji Mountain – loved but also dreaded by Japanese, the Zen garden – representative to the special relation between Japanese and nature, the turtle – symbol of immortality, bonsai – elements of a eternal art. All of these symbols have been disposed in this space that we hope to remain fascinating and mysteriously to each one. Japanese mythology provides a different version of how the chrysanthemum came to be found in Japan. Legend says that, in the beginning, there were so many gods in heaven, that some, including the god Izanagi and the goddess Izanami, have descended to the earth on a cloud-bridge. Once on earth, the goddess created the gods of the winds, mountains, sea, and others, finally dying upon creating the god of fire. Izanagi missed Izanami and so followed her to the place of Black Night where she had gone, only to see vile sights and be pursued by the Old Hag of Black Night. Narrowly escaping back to the earth, the god Izanagi went straight to the river for a purification bath. As he shed his clothes and they touched the ground, they turned into twelve gods. His jewels became flowers: one bracelet an iris, another a lotus, and his necklace a golden chrysanthemum.